Many meat processors and producers suffer from higher procurement prices, while their ability to pass on those increases to retailers is limited. 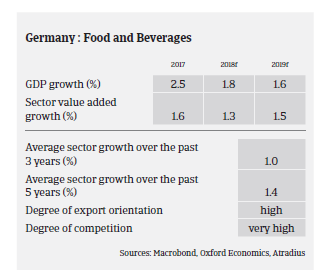 According to the German Food Association BVE, nominal turnover increased 1.1% year-on-year in H1 of 2018, to EUR 88.1 billion, mainly due to slightly higher market prices and sales volumes in Germany and the main export markets. In 2018 domestic market conditions remained difficult for food producers and processors due to rising input costs, including labour costs, and structurally low margins. 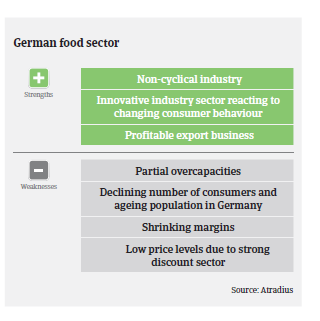 The German food retail market is the most competitive in Europe, with low market prices due to the overwhelming power of the leading food retailers and discounters. This, together with tough competition and price wars in the food retail sector indicate that food producers, processors and suppliers have found it difficult to pass on costs. This situation is expected to remain more or less unchanged in 2019. The situation in the dairy segment has stabilised somewhat since the end of 2016, but volatile market prices and difficulties passing on higher input costs to sales prices remain issues. While overcapacities impact the beverage subsector, many meat processors and producers suffer from higher procurement prices, especially for pork, while their ability to pass on those increases to retailers is limited due to long-term contracts. The introduction of a minimum wage in January 2017 has also contributed to pressure on margins and liquidity, while the market situation is characterised by a surplus supply of standardised meat products. Food producers and wholesalers pay, on average, within 30 days, while payment terms of food retailers often vary from 45 to 90 or more days. With food processing companies and retailers demanding longer payment terms from their immediate suppliers to improve their working capital, a wave of longer payment terms is being created along the whole supply chain. The already low profit margins are further decreasing for many businesses. While the dependence on banks for external financing is high, financial institutions are rather unwilling to provide loans to food businesses compared to other industries. Payment delays and insolvencies have increased slightly, especially in the troubled meat segment, but also in the beverages and fruit & vegetables subsectors. Most at risk to fail are (smaller) businesses that lack export opportunities or that do not offer specialised products, and those companies with already poor financial strength. 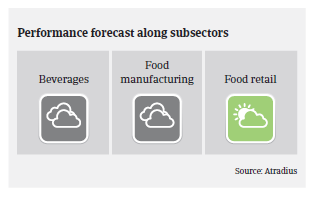 Our underwriting stance remains overall neutral to cautious for the food sector, with a more restrictive stance for meat production, meat processing and beverages, as we expect the difficult business environment in those subsectors to continue in 2019. The German food sector remains affected by considerable fraud cases, which are still rising and getting increasingly tricky and professional. Especially in the fish, fruits and vegetables segments criminal buyers order goods easy to resell on credit terms. Therefore, we pay close attention to the number of credit limits that are applied for within a short period, especially where the buyers are recently established and where management and/or shareholders have recently changed or the buyer’s business sector does not match with the goods ordered (e.g. a steel company ordering food items). The same accounts when a buyer proactively sends financial figures that indicate unusually high profit margins. Of the Western European countries surveyed, Germany had the second highest percentage of respondents (24.7%) who reported revenue loss due to overdues. Margins continue to decrease due to increased material and labour costs, rising competition, pressure on sales prices and the need to invest heavily. Despite the comprehensive safeguarding measures imposed by the EU, the risk of declining steel prices as a result of additional steel inflow remains.